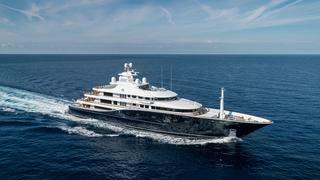 The largest yacht to be built in the USA since the 1930s, AQUILA has a majestic presence. Built by Derecktor, she cruised under the name of CAKEWALK, before being sold and completely refitted. 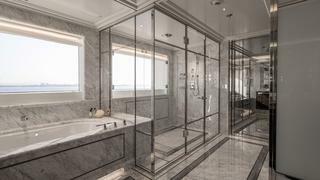 In 2016, Pendennis was contracted to undertake the exterior styling with RWD and Susan Young creating the new interior. 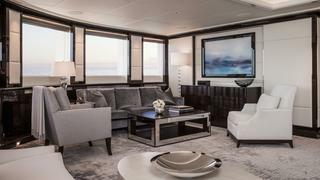 Following 12 months of hard graft and over 1,000 people working on the project, AQUILA emerged looking like a completely new yacht. 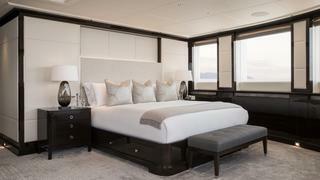 The 85.6m motor yacht offers an abundance of deck space divided into sections to cater for different occasions. 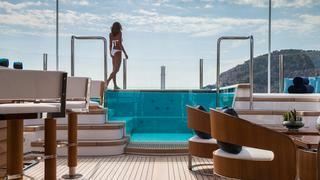 The new forward sun deck offers a large jacuzzi, day bar and treatment room. 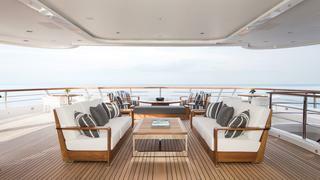 All four decks aft offer an abundance of space for al fresco dining, relaxing and socialising. AQUILA also boasts a dedicated party deck complete with DJ booth, AV system, smoke machine and light show. 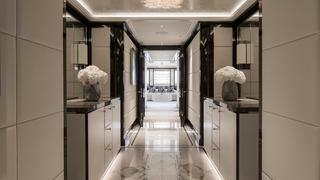 Inside, a cool, calm and contemporary interior creates an aura of tranquillity. Icy silvers, dark browns peppered with nickel and clean whites are accented with patterned soft furnishings and tasteful lighting. 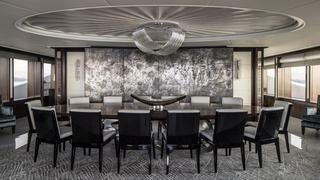 The focal piece of the yacht though has to be the 11.2-metre 'waterfall' chandelier which cascades down four levels from the sun deck down to the lower deck creating shards of light across the white marble floor. 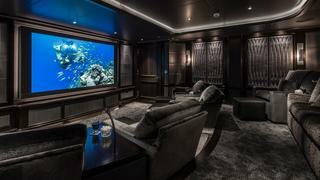 Other new features include a cinema room, where an enormous 85-inch screen pulls focus. The owner's deck has been completely remodelled too to now offer access to a 60 square metre private deck overlooking the bow. 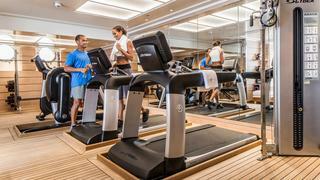 It also offers in addition to the large suite, a massage room, hair salon, his and hers ensuite and study. 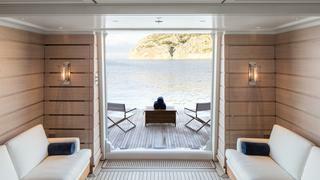 A further seven cabins offer accommodation (in total) for 12 guests. The yacht owns an exclusive member's club vibe with a gym, two massage rooms and an impressive new bar called 'the London Bar'. Alongside her impressive deck spaces and stunning interior, AQUILA has a large beach club offering a plethora of fun water toys, ideal for lazy days out at anchor. 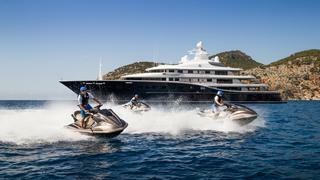 Her zero speed stabilisers ensure comfort while static and the yacht's 28 crew offer an unrivalled personal service.